To download high res image click the thumbnail below (or right click to open the image in a new tab) and then save the image to your computer. 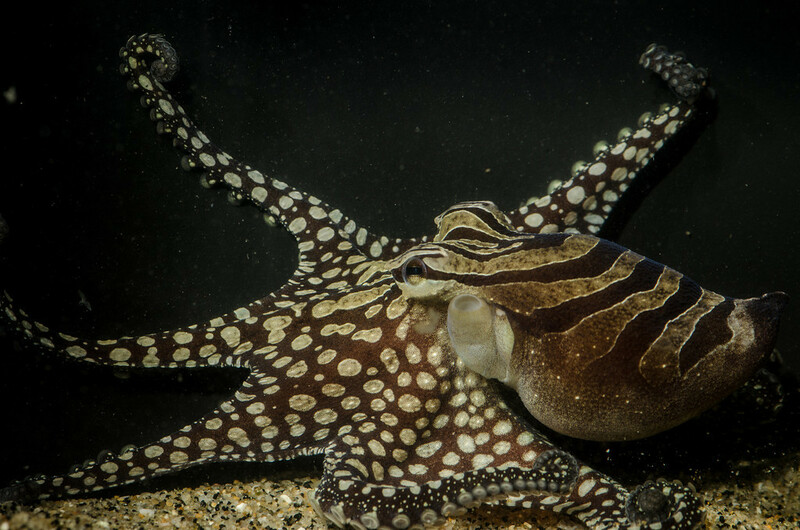 BERKELEY CA (February 12, 2013) – The Larger Pacific Striped Octopus displays striking color and shape changes, shifting in an instant from a nondescript dark reddish black “leaf”, to an awesome clash of white and black stripes over constellations of white spots. 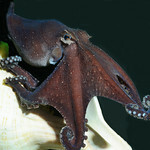 Two San Francisco Bay Area scientists, Dr. Roy Caldwell of UC Berkeley and Richard Ross of the Steinhart Aquarium in the California Academy of Sciences (working from his Secret Home Lab), are studying this long ignored and little studied Central American octopus. 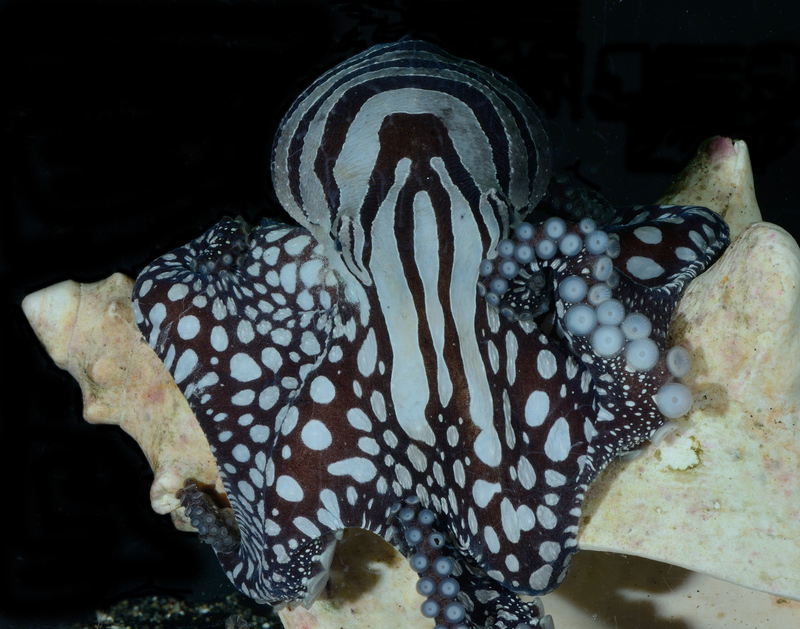 Caldwell, who studies such showy creatures as blue-ringed octopuses, says “The Larger Pacific Striped Octopus is the most beautiful octopus I have ever seen”. 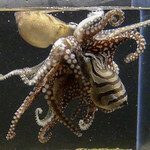 Besides coloration, what makes the Larger Pacific Striped Octopus so different from other octopuses is the way it seems to ignore what has become the standard story of octopus social structures, mating and motherhood. 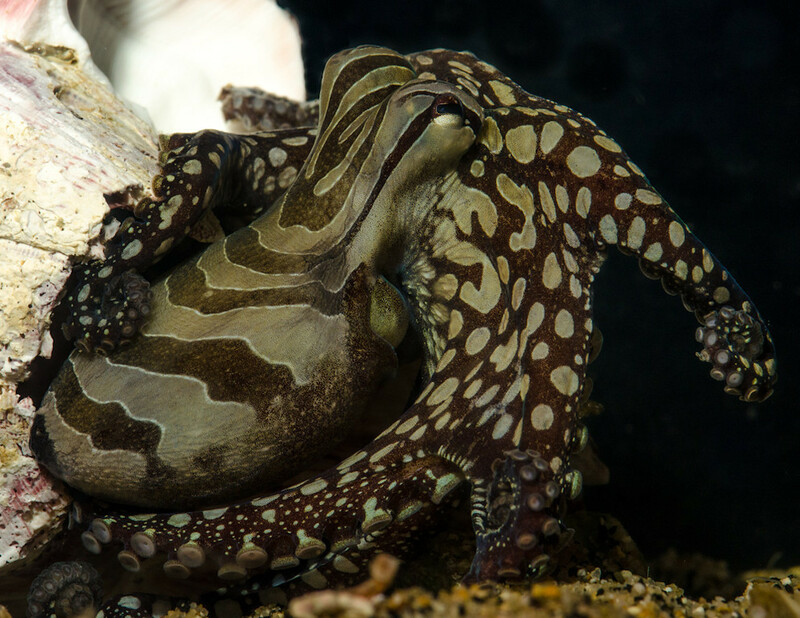 Instead of living a solitary life, and coming together briefly for mating like almost all other octopuses, the Larger Pacific Striped Octopus can cohabitate in pairs, sometimes sharing the same den. 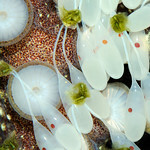 Groups are reported to live in associations of 40 or more animals. 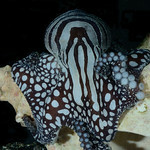 Instead of mating from a safe distance like most other octopuses, or males mounting females as occurs in a few others, the Larger Pacific Striped Octopus are the only octopuses known to mate “beak to beak” with their ventral, suckered sides touching—a position that may be viewed as dangerous considering the cannibalistic nature of cephalopods. 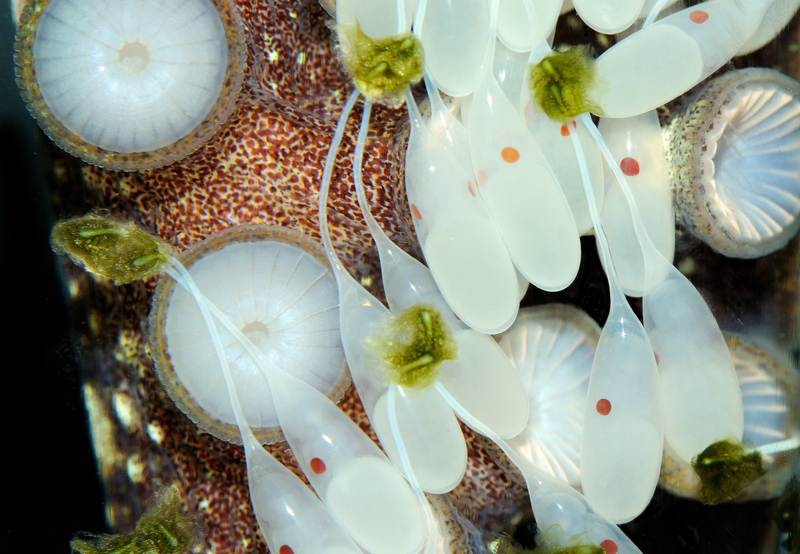 Most female octopuses mate and brood a single clutch of eggs through hatching, only to die as their offspring swim into the great unknown. The Larger Pacific Striped Octopus breaks this tragic tradition. 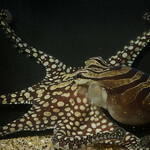 The female Larger Pacific Striped Octopus is iteroparous meaning that she lays and broods many clutches of eggs over her lifetime. One of the only other octopuses known to share this trait is the Lesser Pacific Striped Octopus (Octopus chierchiae), a tiny close relative to the Larger Pacific Striped Octopus. 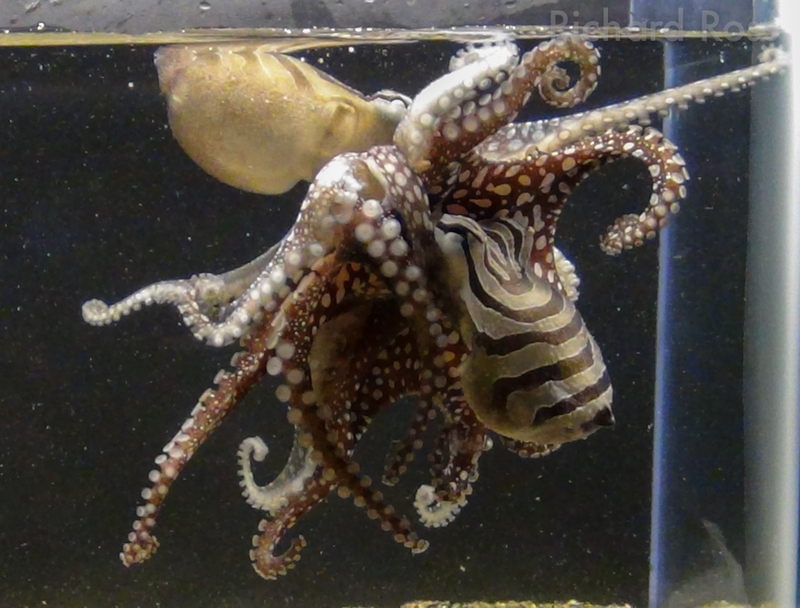 Until Caldwell and Ross began studying the Larger Pacific Striped Octopus, the creature was virtually ignored. 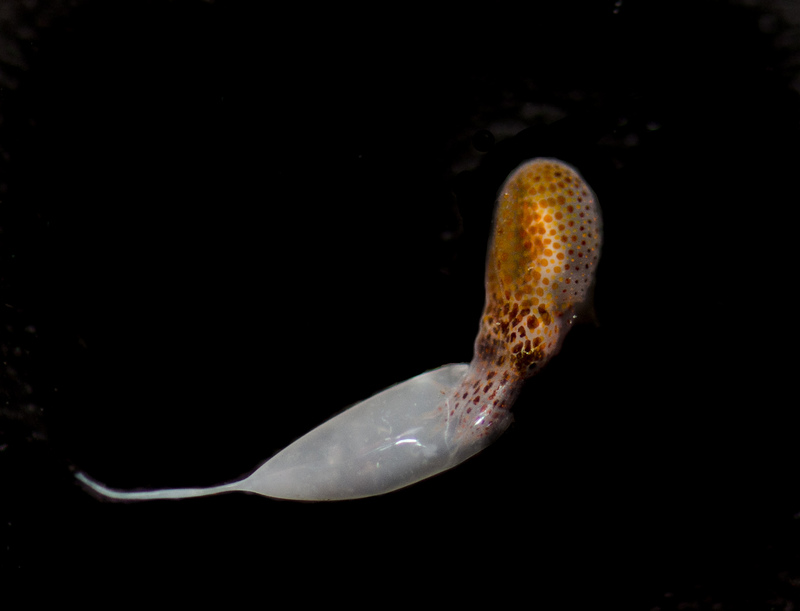 In 1991, Arcadio Rodaniche published a short abstract “Notes on the Behavior of the Larger Pacific Striped Octopus, An Undescribed Species of the Genus Octopus”, providing a tantalizing glimpse of this intriguing animal based on observations he made at the Smithsonian Tropical Research Institute in Panama in the late 70’s. 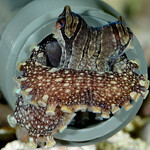 Unfortunately, detailed information contained in a full manuscript documenting the Larger Pacific Striped Octopus’s unique social and reproductive behavior was never published. 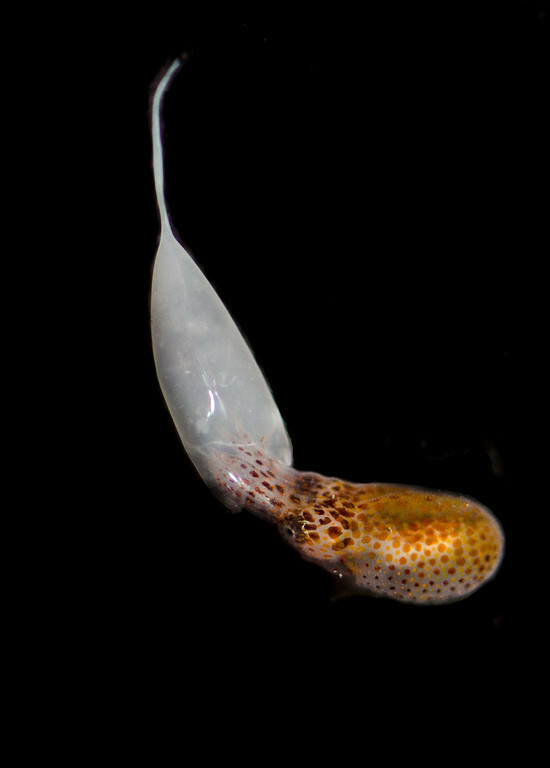 According to Caldwell, Rodaniche’s descriptions of the behavior of this species were so outside the norm of what biologists at the time thought octopuses did, they were dismissed by other cephalopod biologists. Unable to pass peer review, the manuscript was never published and the animal was forgotten. Living LPSOs weren’t seen again until they were rediscovered last year. 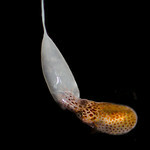 According to Ross “We are thrilled to confirm many of Rodaniche’s observations”. 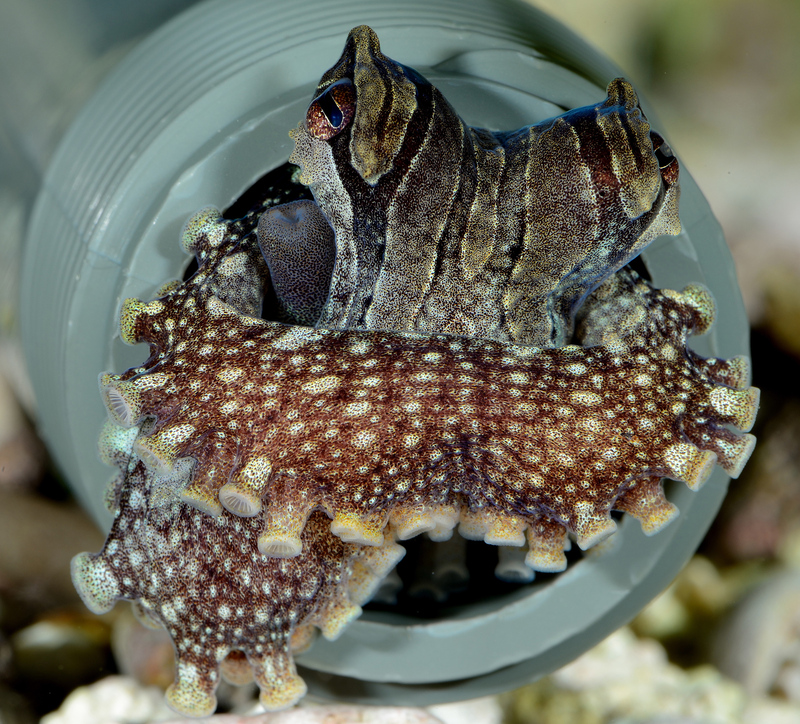 Caldwell, Ross and colleagues are currently working on a species description, a behavioral paper on the LPSO and are hoping to mount an expedition to document the behavior of this octopus in its natural habitat. 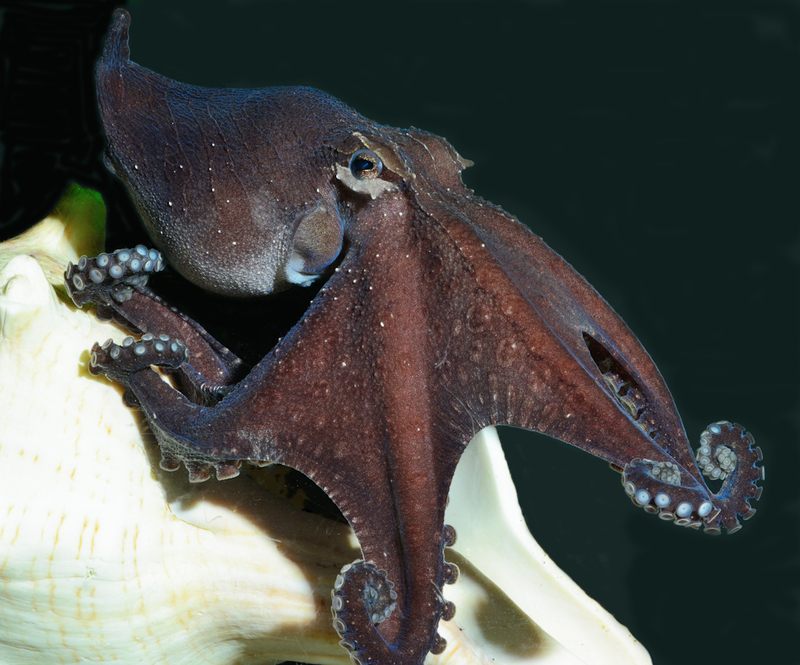 What is the species name of this octopus? 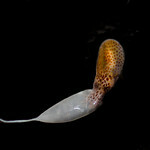 any progress in naming this species? has the paper been published yet?